This past Sunday was Father’s Day and I’m so happy that we were able to spend the whole weekend doing what we love — enjoying the beautiful NYC. As much as we love to travel and explore the world, I feel like we’re really lucky to live in a city that has so much to offer. Summer time in the city is so much fun and we’re always out, especially on the weekends because we have Dada around. My husband works the whole week and tries to get home every day before bedtime, but on the weekends, he makes sure to spend the whole time with his family, especially with his son. 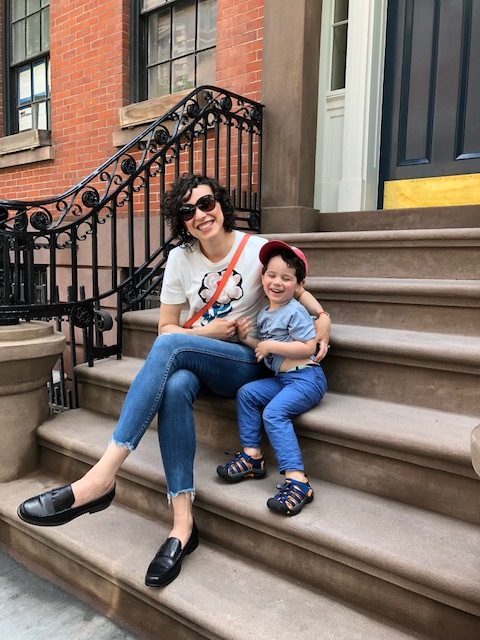 I think summer officially has started in New York City, so that means we’re out more often, the sprinklers are on everywhere, we need to pack snacks on the go, and be ready “to go on a bear hunt” as Dylan always says, haha. One of the things we did on Father’s Day was to wake up early and go to the Central Park Zoo. Dylan has been asking to go back there since we went last time and my husband really wanted to go with him. The Central Park Zoo is small, but it’s such a pretty place and perfect to go with the little ones. Dylan had a blast; he loved everything, especially feeding the goats! They are super cute and want to eat everything, of course. The petting zoo is also my favorite part of this zoo. Another thing D loves is to watch the seals swimming in the pool. I’m not sure how many times he asked if we could go in and swim with the animals. I think that’s not happening! Oops. When we’re out, I always pack snacks no matter where we go! First off, I cannot deal with a hungry toddler because they will become little monsters. Second, having something that’s is going to give my kid all the nutrition he needs, is made with organic ingredients, and be super yummy will give me piece of mind and make my toddler extra happy and healthy. Stonyfield has been part of our lives since Dylan started eating solids when he was six months old. It was actually the first yogurt I gave to him, and I’m so happy this yogurt can “grow” with us. He loves the pouches and we carry them everywhere! It’s the perfect snack to have on the go this time of the year. I have to confess that many times I had more than one pouch in his bag and I ended up eating one!! It’s just so good, haha. Don’t tell Dylan that, he loves his Stonyfield and knows what’s inside his lunch box. Stonyfield and Badger Balm are part of our everyday in the city and we carry them everywhere we go. Both brands are B-Corp Certificated and that means that they are for-profit companies certified by the nonprofit B Lab to meet rigorous standards of social and environmental performance, accountability, and transparency. Thank you so much Stonyfield and Badger Balm for sponsoring this post and for helping the world to be a better place. We love having you as part of our family.